The second chapter of this travelogue takes you to the places that any packaged tour to Vienna is likely to take you — to the grand, imposing Imperial buildings of Vienna. Separately, these structures are extraordinary enough, but put together in a concentrated square-kilometer area, you feel like you are truly on royal ground, walking in the footsteps of mighty kings and emporers. For me, it was an awestriking experience like few others I’ve had. But what’s great about this part of town is not just the beautiful architecture and scenic parks, but also the impressive set of museums available for visit (they didn’t call this the Museum Quarter for nothing, of course). You are going to have to indulge me, as photographs were not permitted inside any of the museums — so all I can show you are the pretty buildings from the outside. The route I will take you runs from the Vienna Rathaus (see the Altstadt chapter) through the Museum Quarter, ending at the Imperial Palace. The Rathaus is quite a beautiful structure, surrounded by its own small park with fountains. The front entrance is paved and flanked with memorials to some of Vienna’s most prominent residents. 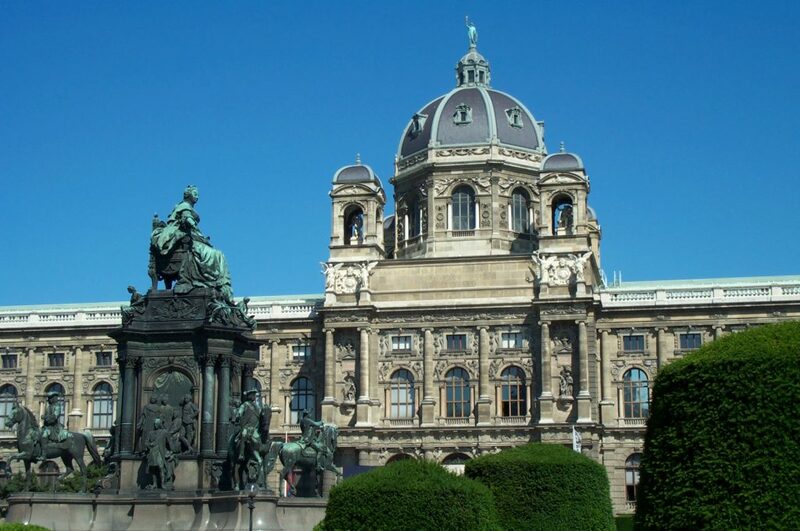 The Rathaus is nearby two other important and beautiful structures, the University building and the National Theater. The theater was undergoing renovation when I visited Vienna, but when complete it will be absolutely fabulous. The Theater is at one corner of the beautiful and large Volksgarten, shown in the second picture with the Rathaus in the distance. This triangular-shaped park has an open-air gathering area for festivals in one end, while the other takes visitors to the front entrance of the Imperial Palace (more later). Like many of Vienna’s smaller public buildings, this mini-Parthenon structure was being used to house a small art exhibit. It seemed not to be uncommon that individual artists would rent out a small public building to exhibit and/or sell their handiwork. Following along the Dr. K. Renner Ring towards Mariahilfer Strasse, you will pass by several more important government buildings. 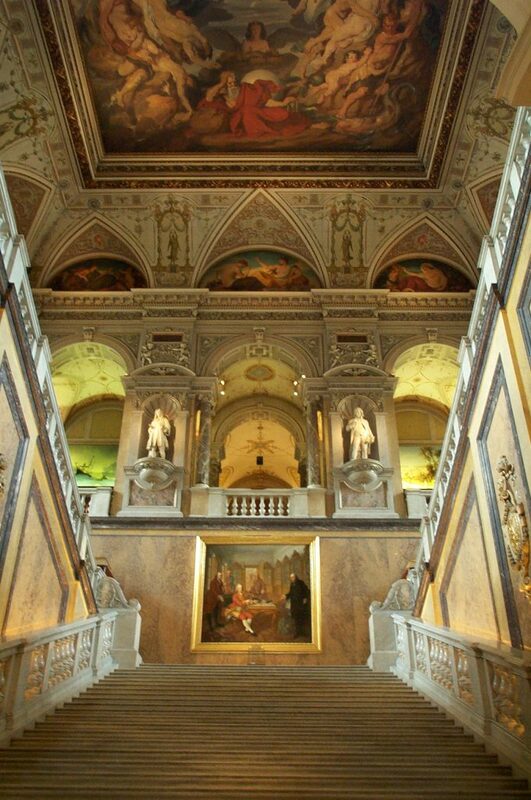 The most impressive and most recently renovated of these is the Austrian Parliament. The brilliant white stone and dozens of beautiful statues gave the building a very majestic appearance. Next to the Parliament is the entrance to the Museum Quarter. There is a huge yellow building (called the Museums Quartier) where that you can purchase tickets to the museums. A day pass or combination ticket can cost about 25 Euro when they are available (ordinarily they are not when any of the major museums are closed). Most of the museums, however, are only a few Euro each so unless you plan to spend a full day museum hopping, you are just as well off buying individual tickets at your selected locations. There are two main buildings in the Museum Quarter, one being shown in the next photo. These buildings face each other with the Maria-Theresien Park in-between. Available here are the Natural History and National Art Museums, each of which can readily consume 1-2 hours. I visited the Natural History Museum, and was amazed at the incredible collection of animals and fossils. Yes, it covers dinosaurs and the evolution of animals, plus has a massive exhibit of stuffed animals including nearly every variety of bird, bear, sheep, monkey, you name it they probably have. It has an aquarium and fossil plant exhibits, along with a history of the Vienna Zoo (described briefly in the Schonbrunn chapter). Then, a mere few hundred meters away lies the Imperial Palace. The Palace is just plain awesome with its impressive facade, well-manicured entrance park. From the Natural History Museum, you will walk through the Burgtor, which is more than just a hulking concrete gate — it contains the royal chapel and a number of offices. 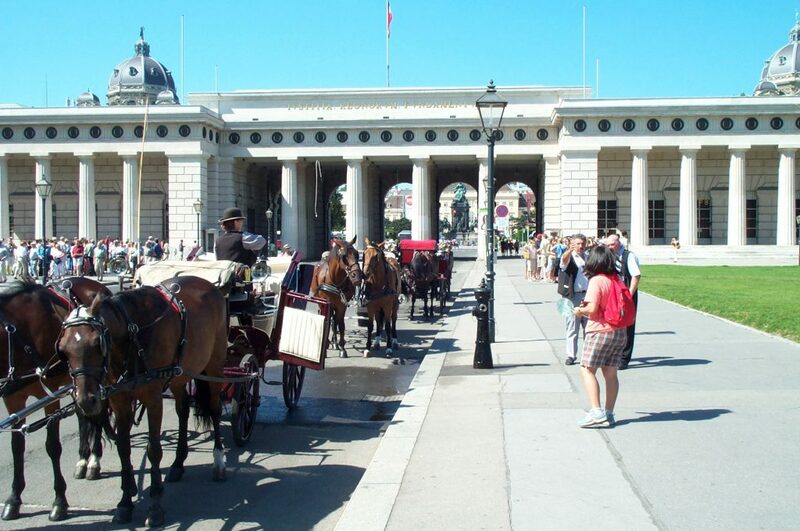 The roadway will lead you to a huge buggy stand, where a long line of horse drawn carriages await to take you around town. Standing in the middle of it all is the Etzh Karl Denkmal, honoring one of Vienna’s former emporers. 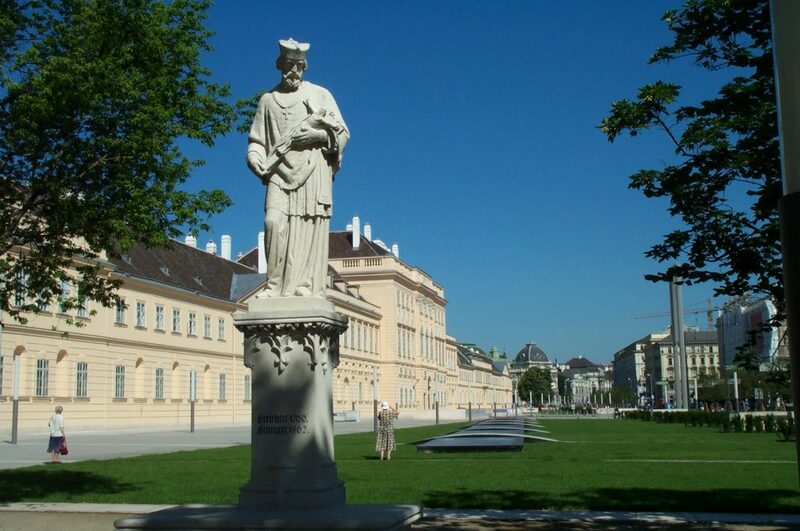 The grounds of the Imperial Palace (known as the Hofburg) are wonderful to walk through. Much of the Palace has been restored. The final photo shows the interior of the courtyard, in the direction of the royal apartments. On the wall behind me were several old brick plaques and other artifacts that survived the numerous sieges and wars in which Vienna participated. A casual walk toward the downtown will take you underneath the huge Michaelerplatz dome, and out to the Michaelerplatz itself. Along the way, you will find a number of souvenir stands — but these stands don’t sell ordinary run-of-the-mill T-shirts and caps, these are very classy, offering the finest porcelain and glass artworks graced by famous composers and Austrian kings and queens. I visited five of the nine or ten museums in the Palace grounds. 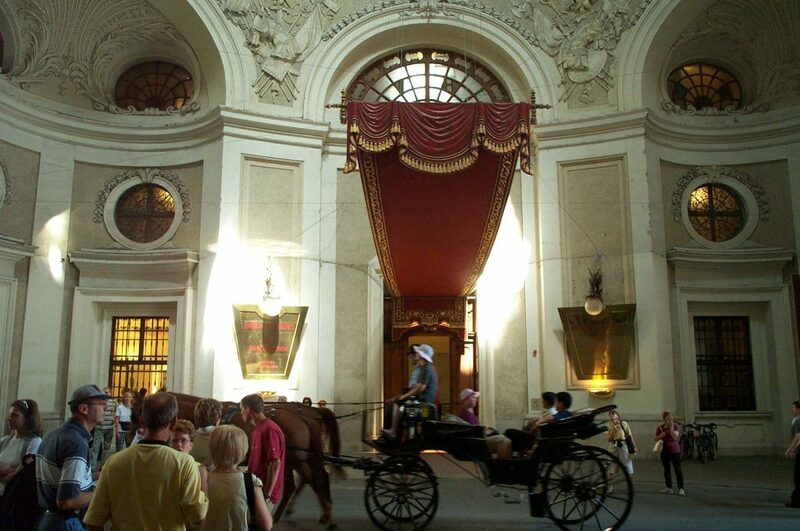 These included three accessible through the main palace entrance, and two near the Michaelerplatz. For a flat-fee of about 7 Euro, I visited the Arms and Armory Museum, the Museum of Musical Instruments, and a Museum of Ephesian Architecture. The first of these shows the development and history of armor and weapons from medieval times to 19th century — including European and Asian (particularly Ottoman Empire) arms. The second shows musical instruments of all sorts during the same general period. If you use the audio guide, you will have the opportunity to hear samples of the musical instruments being played. The last of the three was all imported materials and it only marginally interesting to me. The other two were the Silver Exhibit and the Royal Apartments. The former shows you the entire breadth of elaborate and wonderful kitchen and tableware used by the Austrian monarchy, while the latter was similar to the apartment tour in Schonbrunn — a room-by-room tour of life in luxury. Other musuems that I didn’t get to included the Schatzkammer (Royal Treasury), Chapel, and the Spanish Riding School (which is a difficult ticket and open only at limited times). Yes, this part of Vienna is as extraordinary and enjoyable as it is enormous. I would have to say that this part of the city is a virtual requirement for any visitor to see.